Recent models of dialect contact, notably in the work of Trudgill, Chambers, James Milroy, and Labov have stressed the importance of the notions of salience, simplification, linguistic complexity, and the speech community in accounting for the patterns that arise. 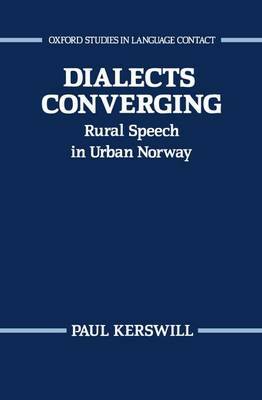 In this case-study of the speech of rural migrants in the Norwegian city of Bergen, Paul Kerswill critically examines the usefulness of these concepts, and puts recent models of dialect contact to the test for the first time against a case of such contact as it is actually happening. Dialect contact often, it is said, leads to Koineization - the emergence of new, mixed varieties of a language resulting from the intermingling of speakers of different varieties of that language. Kerswill investigates the extent to which processes of change typically ascribed to Koineization are already prefigured in the speech of the first-generation adult migrants of this study. While the author's approach is broadly quantitative he also demonstrates the importance of ethnographic and social-psychological explanations in accounting for the wide differences between individuals in the study. He argues for a sociolinguistic methodology founded on a richer and more comprehensive view of the social factors influencing, langague use.